It’s hard, isn’t it? Having everything you know function one way for so long and then suddenly you have to move, a loved one passes away, your friend betrays you, you lose your job; I mean, the list is literally endless. And it doesn’t have to be something nearly that big to make us resist: a phone update, a new hairstyle, or a character leaving a TV show can send us right over the edge. 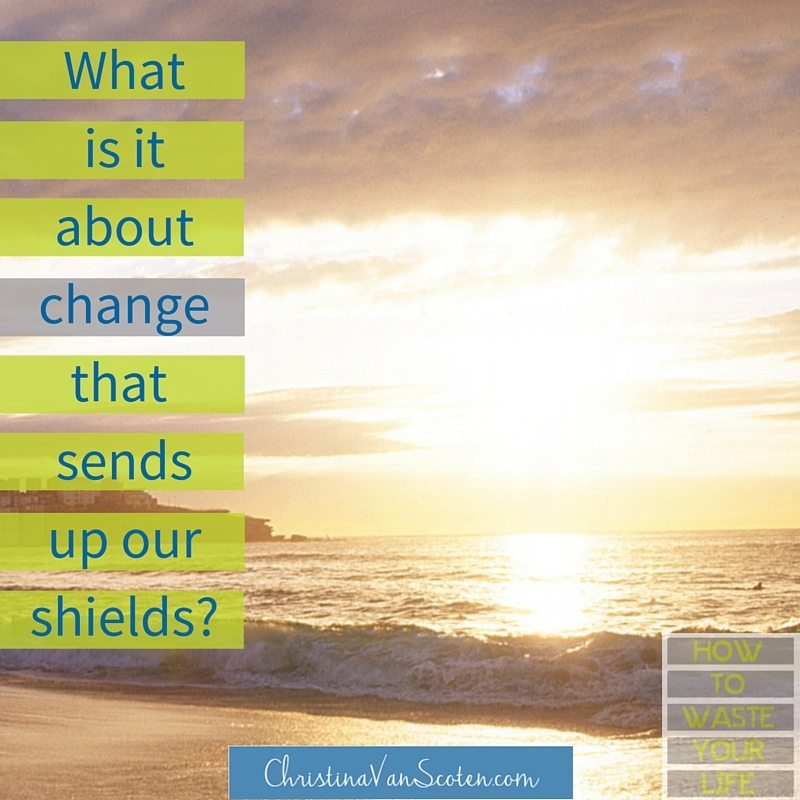 What is it about change that automatically sends up all of our shields, doing everything they can to keep it as far away as possible? It’s been my experience that I can resist something with all of my strength, but all it does is make the inevitable transition that much harder. So why do we linger in resistance instead of learning to re-position? Change is like getting out of bed in the morning. You can lay there under the covers as long as you like, but that doesn’t mean your obligations go away. All it does it make your day harder because you’ve given yourself less time to complete your tasks. Likewise, if we accept change sooner rather than later, we give ourselves more time to adjust to the new reality smoothly. The alternative is to hide under the covers for the rest of our lives–which means no food, no coffee and no internet, and who wants that? Why do we linger in resistance instead of learning to re-position? What do you think of these questions? What kinds of changes do you resist most? Are you still having trouble seeing what the positives are in your change? Sometimes it’s easier for someone outside of the situation to spot them; if you’d like to share, I’d love to help!